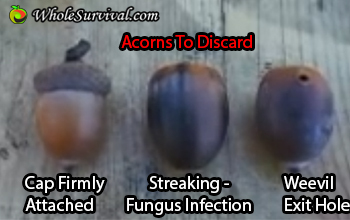 This is a great informative video about collecting and processing acorns to make them into an edible food. Arthur Haines has a few other really good videos as well about wild foods and nutrition. I wish he had more, actually. I love his hand gestures as he speaks. He starts by telling us the differences between the various oaks, the black oaks and white oaks group. More in depth than the usual difference in the leaf patterns, he describes the internal differences bewtween the acorns as well. Then he shows us how to tell which acorns will be edible by discarding the acorns that are blemished in some way. He goes into a bit of the history of acorns as food throughout the video which I like since it gives us an idea of how acorns used to be processed and used by ancestral peoples. As well as going into some of the nutritional value of the acorn. Drying the acorns is the next step as he explains to better preserve the nuts for future processing and use. Shelling comes next, and he shows us an easy, although somewhat labor intensive way to remove the meat from the shell of the nut. Shelling becomes much easier after they have been dried. After another nutritional segment concerning the bad tannins in the acorns, he starts to grind the acorns to a fine particle size in order to remove the tannins more quickly using water. He demonstrates a cold leaching method of removing the tannins by using multiple changes of water at least once a day (taking course over a few days). The acorn flour is ready when is has no more bitter (bland tasting) and no astringent taste to it. Once that is done, the acorn flour needs to dried in a thin layer at a low temperature so that it can be stored safely and without loss to the nutrition.